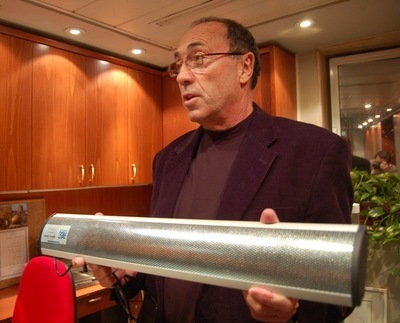 The Inferno sonic barrier is a device that uses sound to create a barrier. Fans of Frank Herbert will recognize the sonabarrier from his excellent 1977 novel The Dosadi Experiment. The Inferno sound barrier device sounds like a very loud siren; the sound fills a defined area. People within the area experience vertigo and nausea, and feel compelled to leave. The device outputs sound energy at four frequencies between 2 and 5 kHz. The combination of these frequencies produces its unusual effects. Sonabarriers in the Herbert novel are used to keep birds confined or restricted in their movements. A flock of them strutted with avian insolence…while they watched the outlying streets for signs of food. They also watched the Rim, but it had been temporarily denied them by a sonabarrier. Inferno has sold several of the devices, one to Russian nuclear weapons storage facility. The idea is that the device could be used to define an area in which human beings could not enter.